News: Malaysia Airlines are adding video on demand for all classes, and giving personal video screens in all cabins, with touch-screen based Select 3000i. The new AVOD in-flight entertainment system is fitted to all new Airbus A330-300 and Boeing 737-800 aircraft. A few of Malaysia's Airbus A330s have Select Plus, with AVOD and video on demand. It is a pretty normal airline AVOD IFE (Audio Video on Demand Inflight Entertainment System) which allows you to stop, start, pause and rewind films on demand. All the 747s have seatback videos as standard, except for a few of the really old planes which just have old fashioned overhead projection screens: these have mostly been phased out. However, the Boeing 737-400 does not have Select Mainscreen or either version of Select 3000i, and does not offer audio video on demand. There are three types of Select, but in almost all cases you'll get Select 3000i - however a few older aircraft have Select Mainscreen in the economy cabin, and a Select 3000i Portable Media Player in business. This is the main seatback TV system, which confusingly comes in three different versions. The mainstream AVOD system has a touch screen seatback TV, however on some aircraft AVOD is only available in First Class and Golden Club Class (Business Class), such as the A330-300, Boeing 737-800, Boeing 747-400 and Boeing 777-200ER. 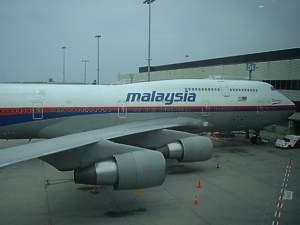 Older Malaysia Airlines Airbus A330-200 have seatback TVs in economy, but they show films on a loop, and have no AVOD. A portable media player is handed out in business class if you are unlucky enough to have an old A330-300 aircraft on North and South Asia routes. In in economy Class on A330-300, it's back to the 1980s, with just overhead TV screens. Ths is called Select Mainscreen. There are 15-inch dropdown retractable LCD screens are installed at every 4th seat row in economy class zone. 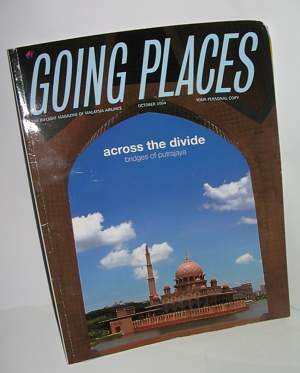 The inflight magazine of Malaysia Airlines is called "Going Places". It is produced in Malaysia by an offshoot of Spafax. You can take copies off the planes without problems. It is actually a pretty decent read, and is professionally put together. There are a series of regular features, including Happenings, with a list of events this month around the world, and Shelf Life with books for the beach. The Trends section shows all sorts of things you would never want to buy. The bulk of the magazine is taken up with a series of travel articles. Admittedly they are taken from the same syndicated articles that many other magazines use, so changes are you may have read some before, but there are loads of them, typically ten or so, all very well written. At the back is Navigator with the inflight information. There are pages of information on how to use KLIA, how to get into the country, and how to use your seat. Finally on the last page, there is a very good map of Kuala Lumpur.